I love my home in Waterloo Region. This past weekend was the first at home since before Father’s Day. Being away really helped me see my community through fresh eyes again. 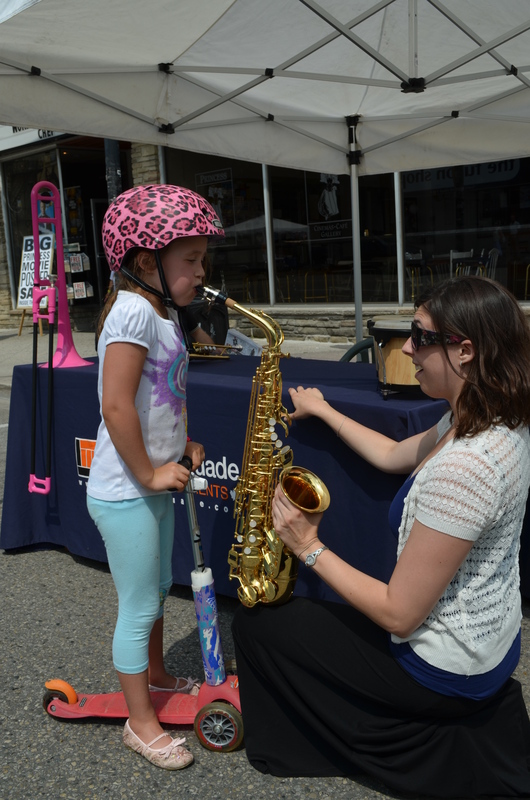 There are so many community builders who are helping to shape us into a livable, sustainable city. 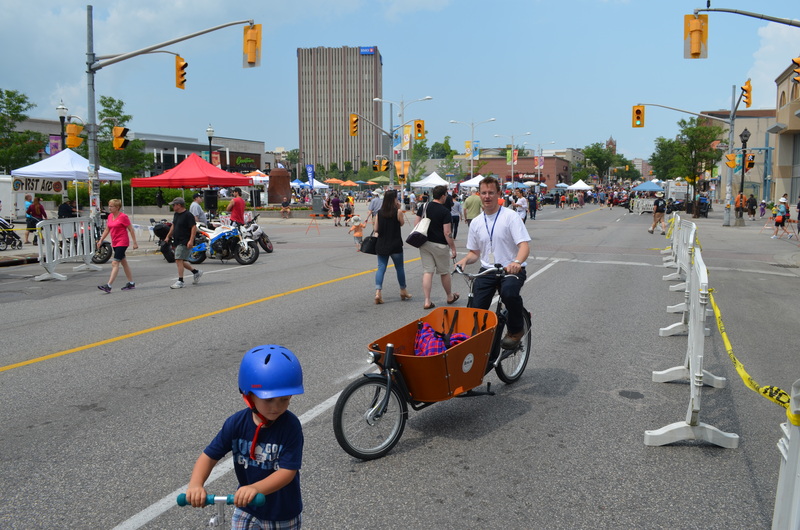 There were lots of people out to Open Streets Waterloo this past weekend. It surprised me cause my neighbourhood was super quiet, it seemed lots were away, but everyone who was in the city seemed to come to Uptown. It was quite a bizarre mix, kids zone to urban evangelists to crotch rockets to wrestling. And a real twilight zone lesson on bicycle security. 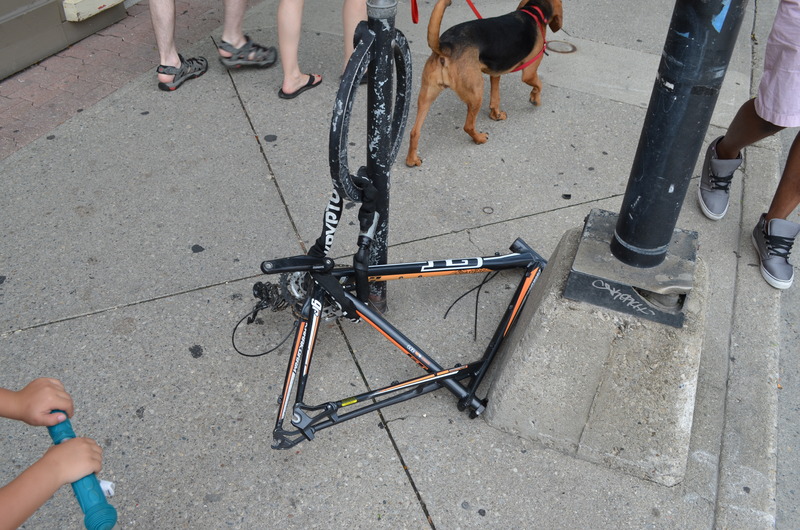 Right outside the Starlight, I came across this bike frame that was still locked, but had been totally stripped, as in only the crank and bottom bracket remained. I figured it was a good example of how not to lock a bike, especially a $1500 mountain bike. After I snapped the picture, the guy in the grey shoes (top right) rather sheepishly said ‘I guess it’s worthy of a picture’. And then promptly unlocked the bike and proceeded to tell me his story. The night before he’d come to the Starlight, and partied way too hard. After drinking himself silly, he passed out in the washroom. His friends somehow got him home. He was dumbfounded how in one night on the busiest street in town, his $1500 bicycle was dismantled. I wanted to tell him how to properly lock his bike, but he was hurting too much. 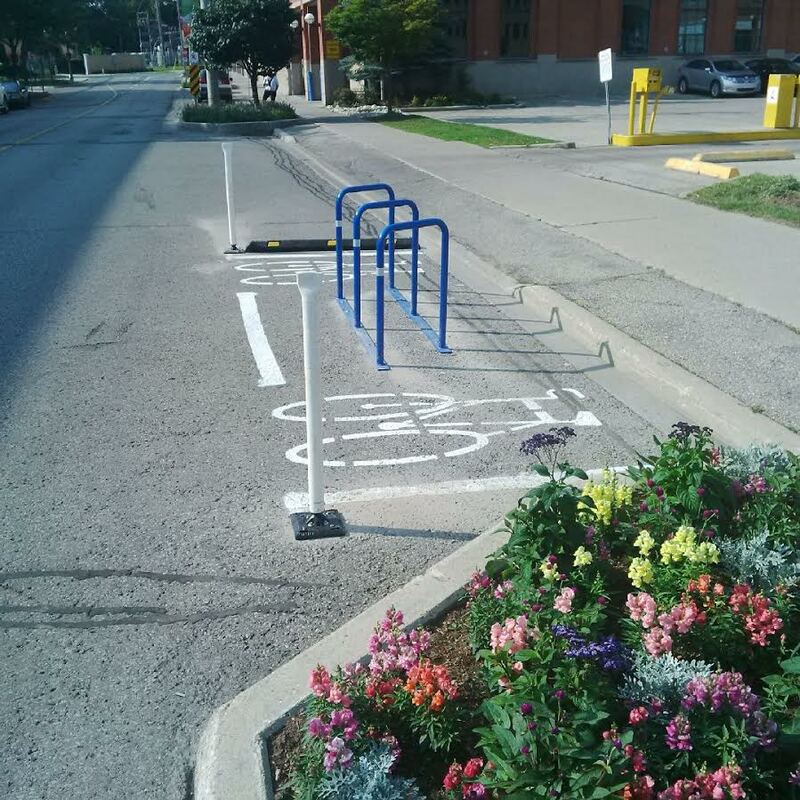 While we’re on the topic of bike security, what do you think about Waterloo’s new on street parking? 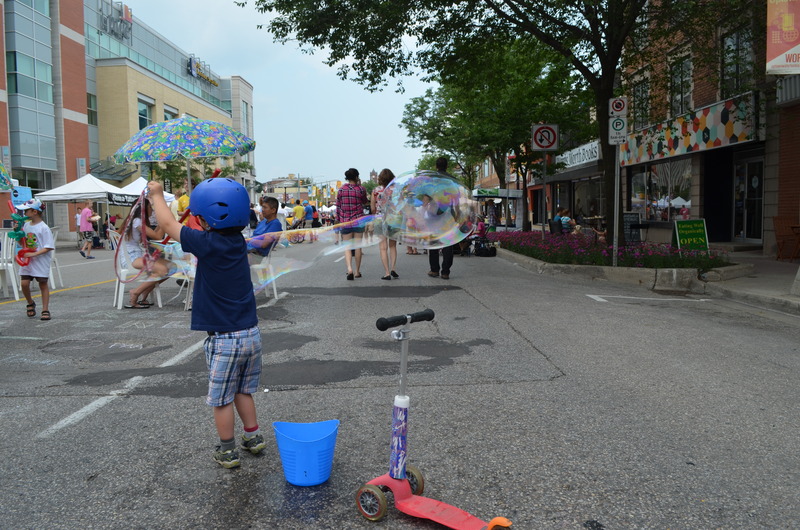 Some other pictures from Open Streets Waterloo. 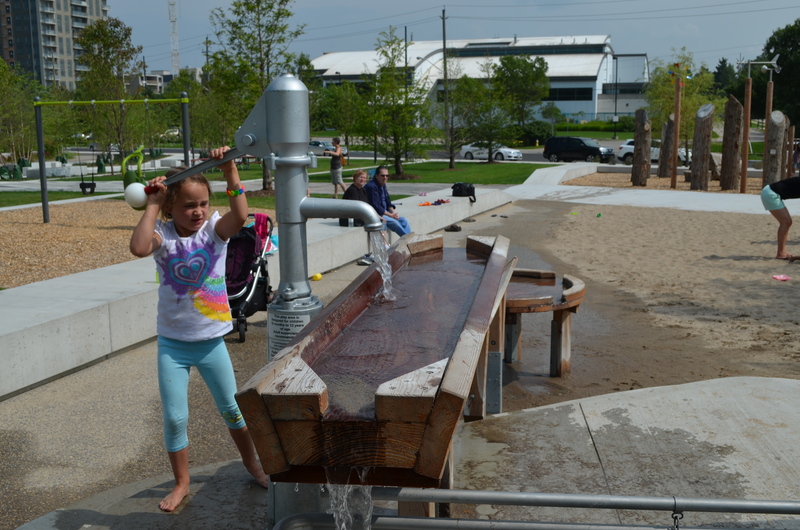 Waterloo Parks new playground, kids loved it! Scary stuff! Even the best lock job won’t save your cranks, derailleurs, etc. Maybe this is an argument for single-cog drivetrains, at least for bikes that might end up locked outside overnight. Cyclists are nuts. We not only have to worry about big pieces of steel running over us, we also have to worry about securing our bikes and accessories. And of course, there’s only people stealing bikes and parts because there’s people buying “used” bikes and parts. So it seems that the main thing we can do about this part of the equation is avoid buying “used” parts, unless we know very well where it comes from. I found your site because yesterday somebody stole my child bike trailer that was attached to my commuter bike. That happened during the day, in plain sight, in King St S, close to Vincenzo’s. It’s a real bummer about your trailer Thiago. I hope you have good luck and find it again. These two examples of brazen thefts make me wonder if there is a “professional” theft group operating again like the one the police busted last year. Graham, for the rest of us who aren’t hurting _yet_, can you teach us how to lock a bike properly? 1 – Lock your frame and rear wheel to something solid with a U-Lock or heavy chain. I can barely recognize parts of King St. in downtown Waterloo. I should visit K-W one day, Graham to see where the region is at.